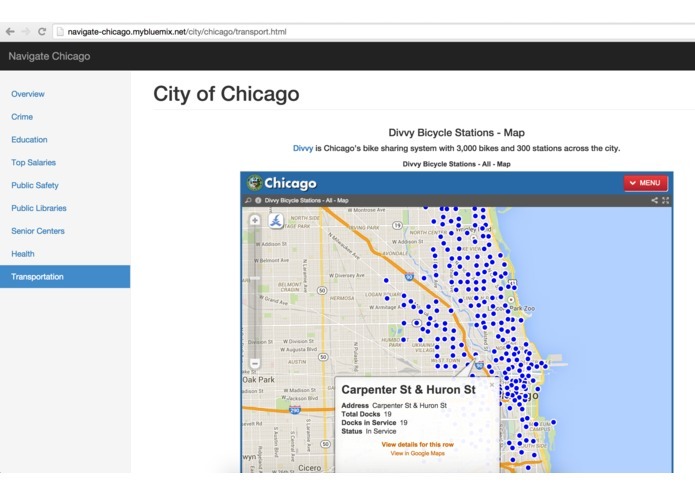 Explore Chicago - know your city. Chicago is a great city. 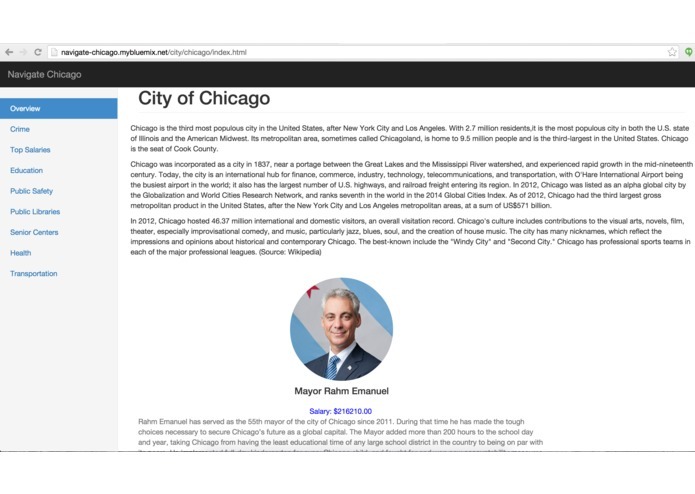 The city of Chicago has an excellent web site. 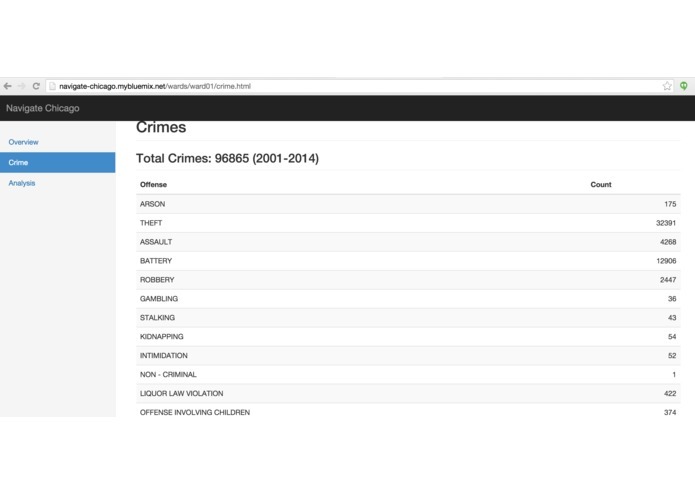 It also has a data portal where it makes a lot of data available for analysis and consumption. But there is no way for the common man to use this data. The common man cannot figure out where the nearest health clinic is or the library is, based on the data services that the city provides. 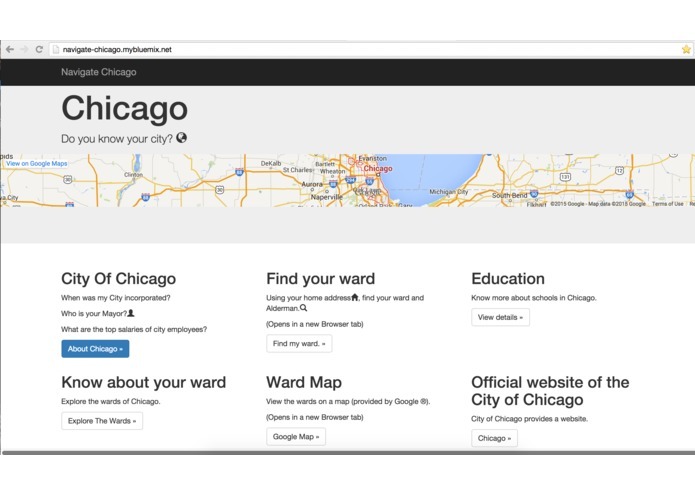 While you may use google for searching, it is not the same as finding out clinics and senior centers run by the city. 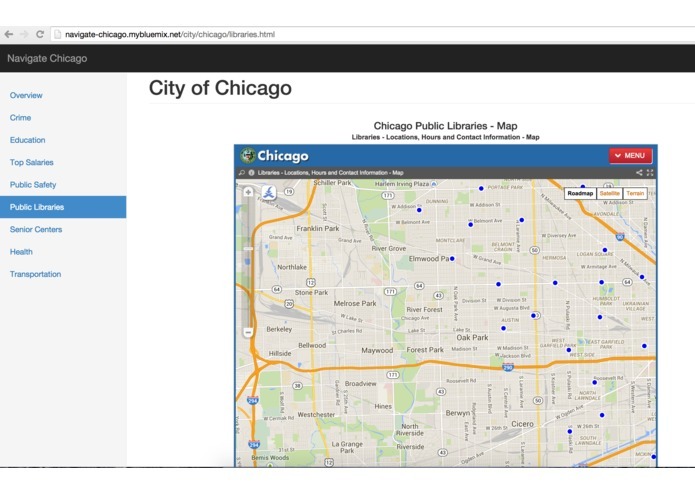 You will need to get it from the City Maps currently deep inside the Chicago Data Portal. 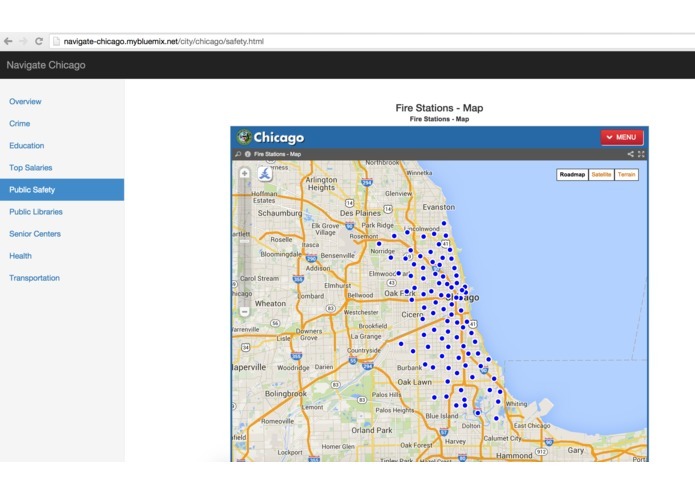 Navigate Chicago is a web portal that has two aims: a) Be a usable web application that provides access to many of the data services such as Police Stations, Fire Stations, Schools, Wards on a map. 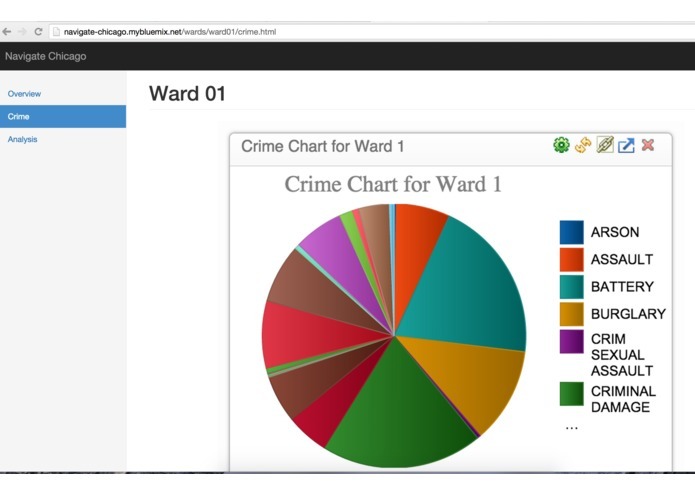 b) Provide analysis on crimes in the city and at the ward level. How safe is the city? 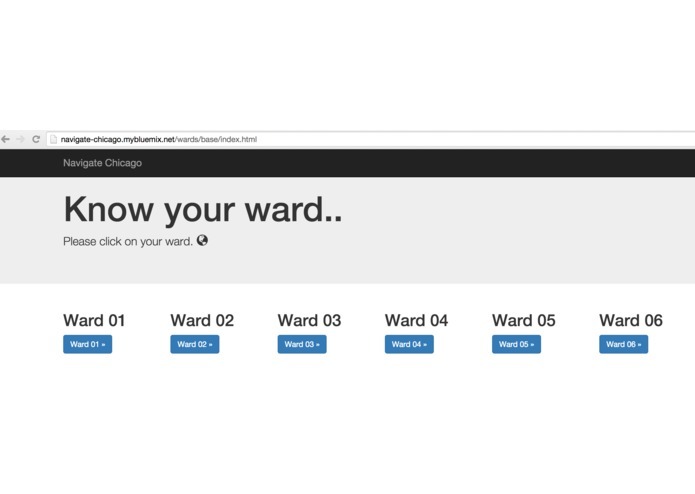 How safe is the ward you live in? 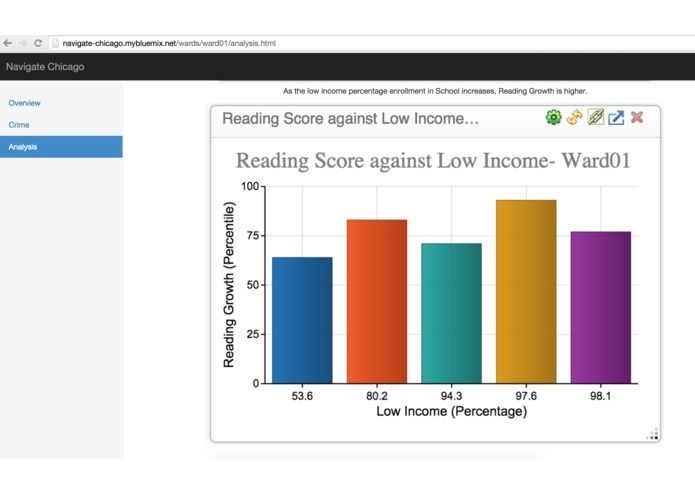 Also analysis on schools for ISAT composite, Math and Reading Growths are charted against the low income enrollment percentage at the ward level. 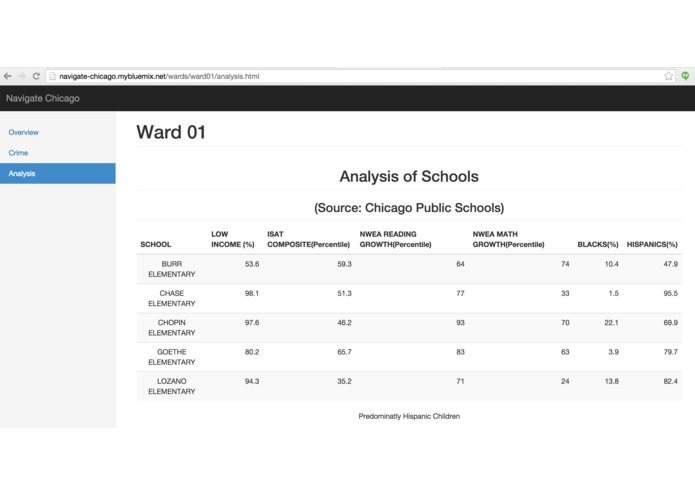 Do you know how the schools in your ward perform? 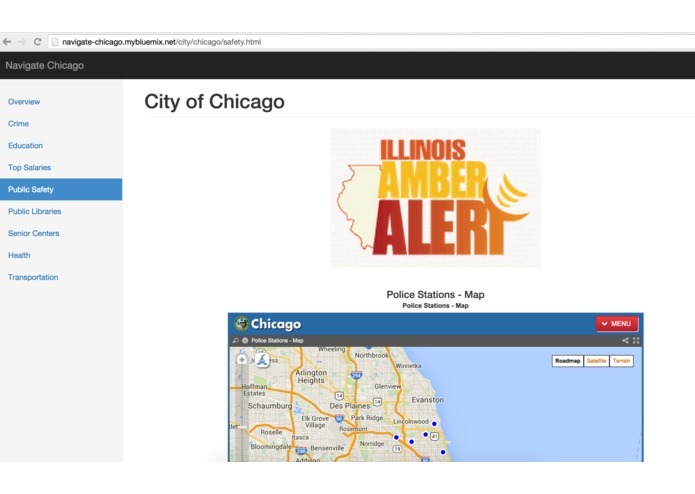 If you are a Chicago resident, you can use this web portal to get the latest information on various things such as safety, education, health, libraries etc. 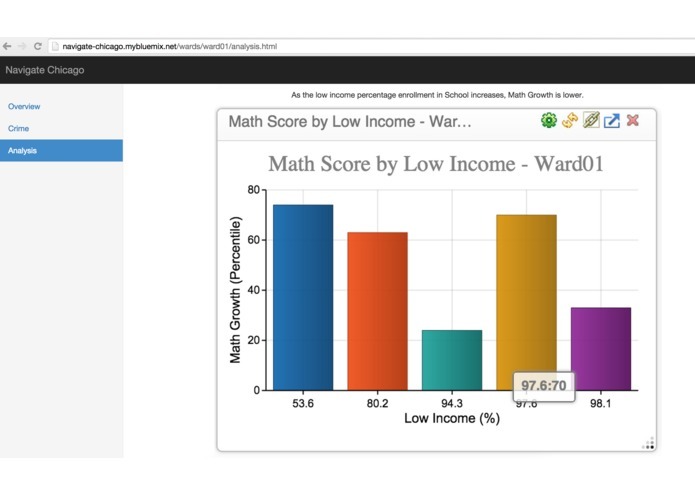 You will also learn more about how your ward schools are performing from Math and Reading growth perspective. How can I use the web portal? From the main page, we have clickable buttons. You click on the area you are interested in. 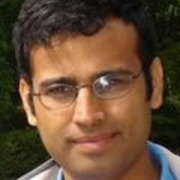 We provide links on the individual pages. 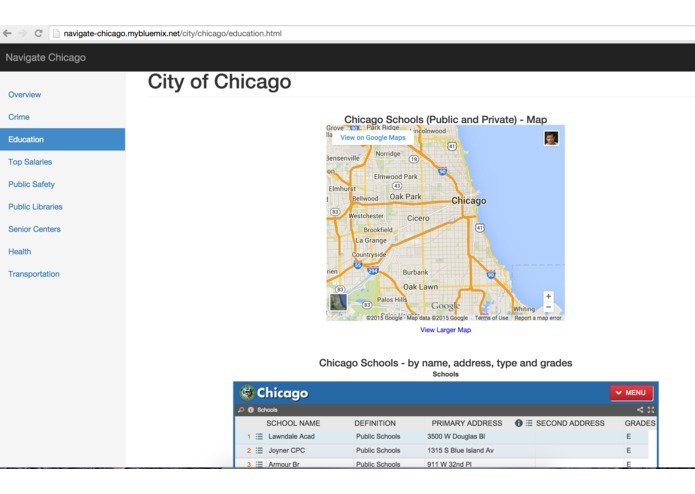 Why is the Chicago Data Portal not sufficient? 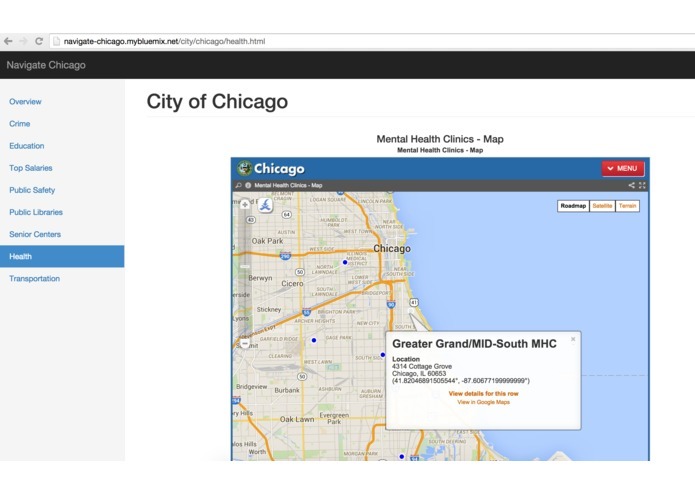 The Chicago Data Portal exposes data sets, services and maps that is useful for different types of people. They may not be relevant to you. You are looking for one particular thing - be it libraries, schools or health care. 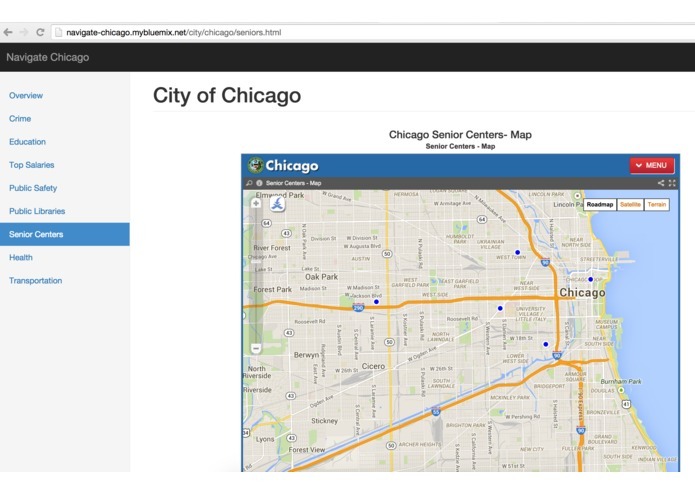 NavigateChicago helps you by embedding the Chicago data services and maps, in an intuitive manner. What is your analysis that I can see? 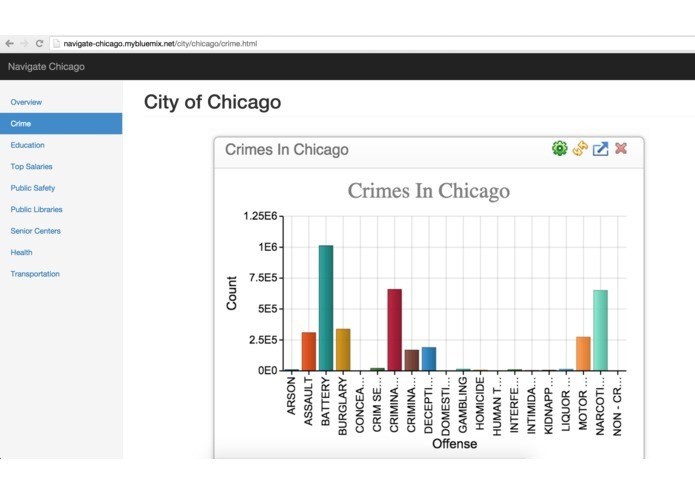 Imagine a data set of Crimes that have happened in the City of Chicago since 2001. That is 15 years of information. In fact it is 54 million records. You cannot analyze this with Excel. You will need special programs. 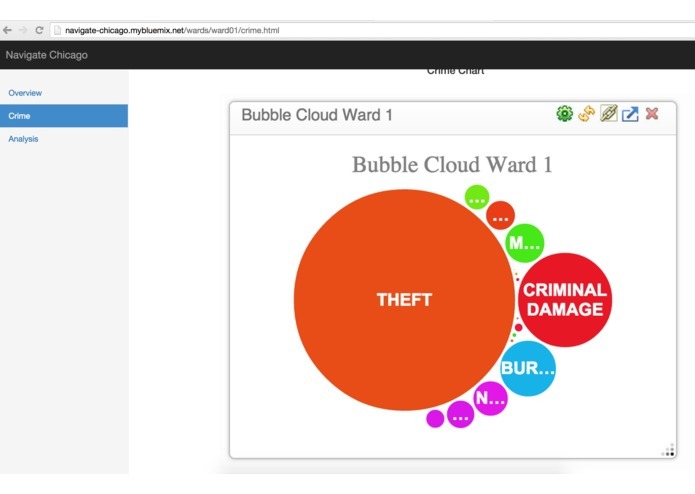 IBM BlueMix has BigSheets that enabled us to analyze this massive data set. 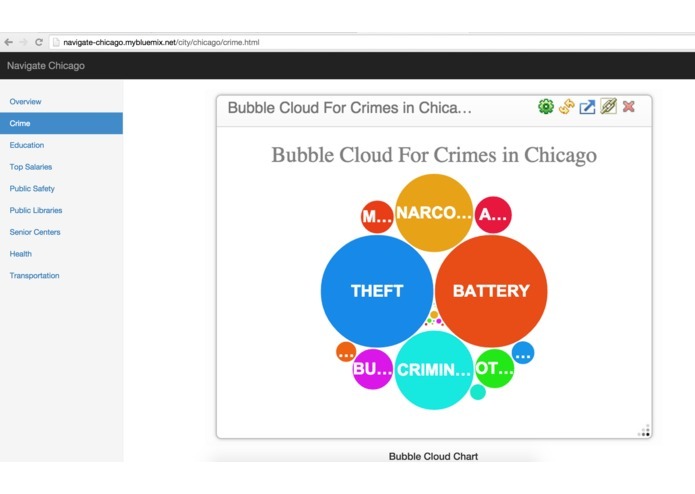 Now NavigateChicago has analyzed this data set. 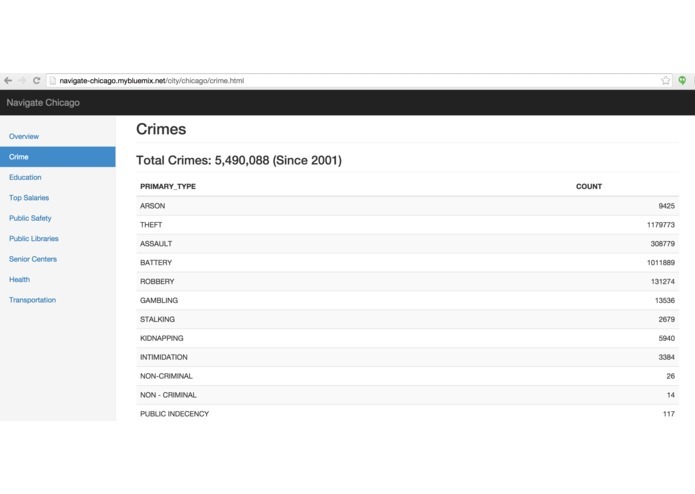 Crimes were aggregated by primary types. Crimes were aggregated at the individual Ward level. Charts are prepared for the crimes at the Ward level. 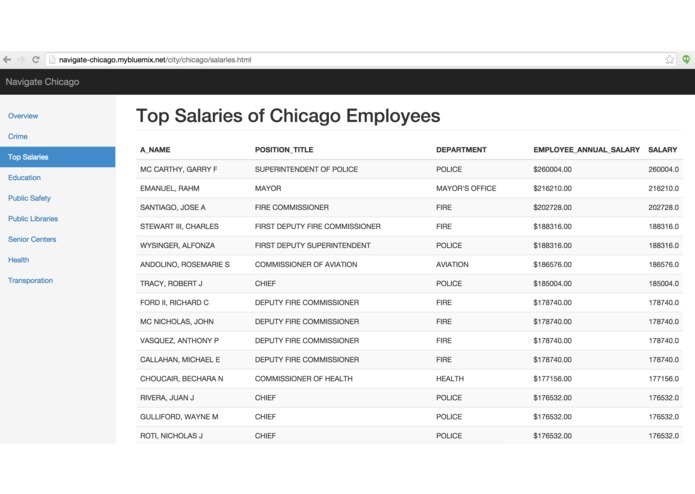 City of Chicago provides names and salaries of all its employees. That is about 50000 records to process. NavigateChicago has processed this data. Now you can see who the Top 50 salaried employees are in Chicago. 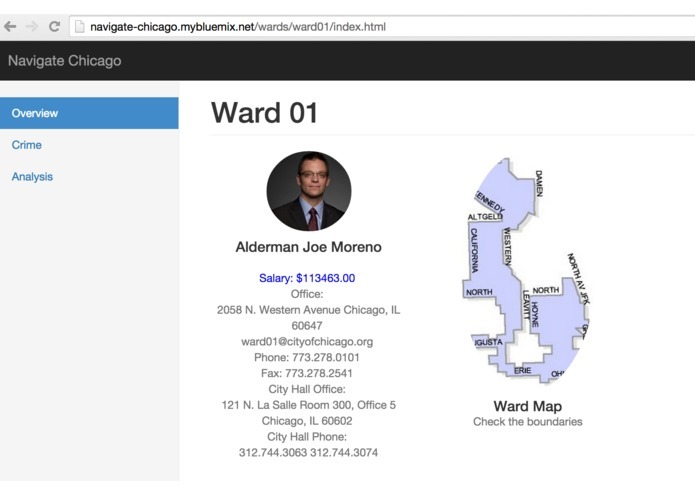 Also when you go to your ward pages, you can see the latest salary of the Alderman. You live in a Ward of Chicago. There are many elementary schools there. Do you know the ISAT Composite Score, Math Growth or Reading Growth of the elementary schools in your Ward? NavigateChicago provides that information. We also list out the percentage of enrollments that are low income. 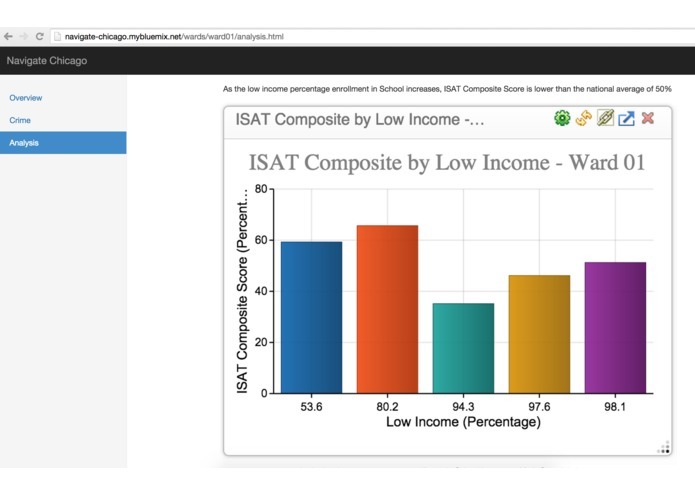 Charts are provided that depict ISAT composite score against low income enrollment percentage, Math growth against low income enrollment percentage and Reading growth against low income enrollment percentage.